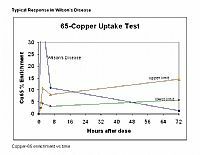 The Copper-65 absorption test is useful in the investigation of suspected Wilson’s Disease or copper malabsorption.35 An oral dose of stable (i.e. 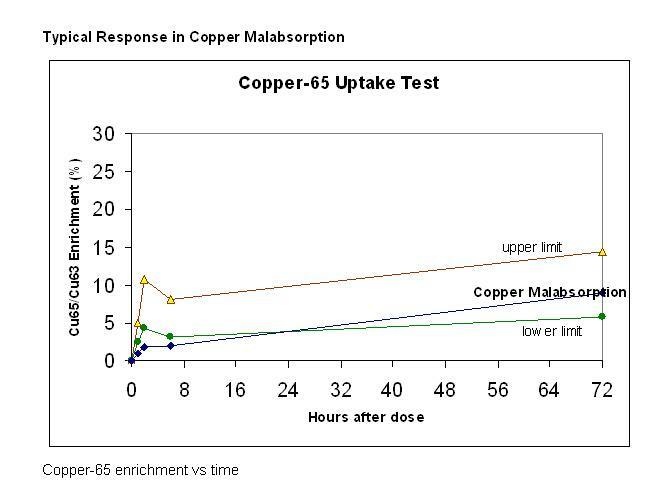 non-radioisotopic) 65Cu isotope is ingested by the patient. 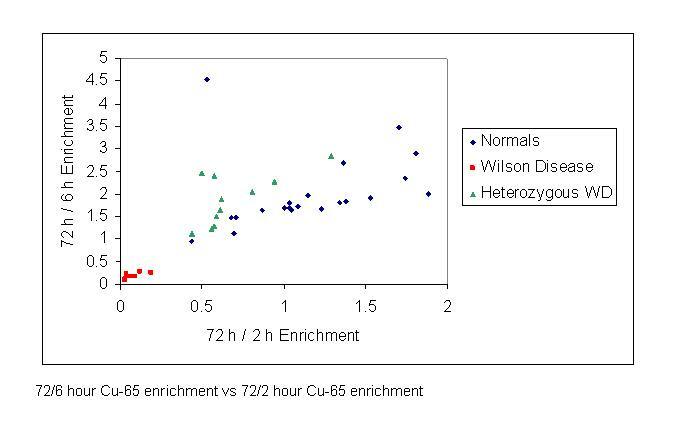 Sequential plasma samples from a normal subject show a characteristic rise in 65Cu enrichment at 1-2 hours as 65Cu is absorbed from the gut. This then falls to a minimum at about 6 hours as 65Cu is taken up by the liver. 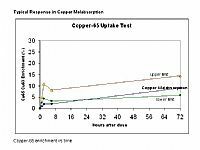 Thereafter, a secondary rise in the 65Cu enrichment is observed as caeruloplasmin, the main copper containing plasma protein, is released from the liver over the following days. 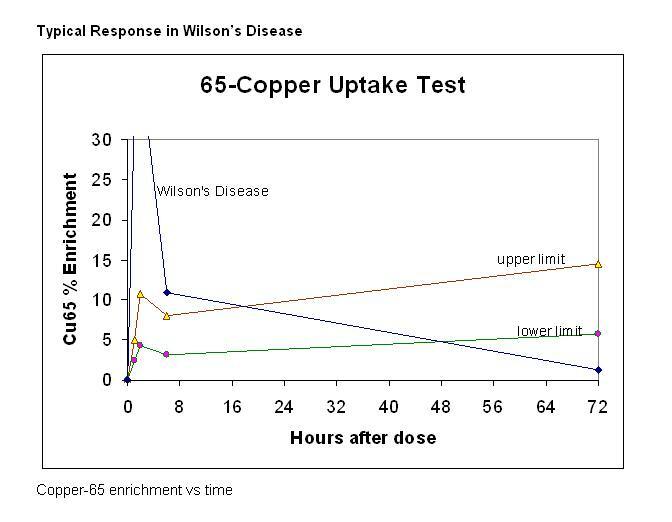 In patients with Wilson's disease the early rise is enhanced and the secondary rise is missing. This pattern, as well as the typical pattern of results when 72 h/6 h is plotted against 72 h/2 h can be used to investigate suspected Wilson's disease. In order to determine whether a family member of a Wilson’s Disease patient is heterozygous, plasma is collected at weekly intervals up to 4 weeks. The percentage 65Cu/63Cu enrichment is measured by inductively coupled plasma mass spectrometry. The test is reported graphically. Please see protocol for full details. Plasma/serum: lithium heparin (non-gel), plain, or ‘Trace Metal’ tube (plain or heparin). SST, lithium heparin gel and EDTA tubes are unsuitable. * This is the absolute minimum volume; these volumes are insufficient to carry out a repeat analysis in the event of an analytical problem.